Ted Thomas: I’ve been showing investors the secrets to successfully buying tax lien certificates and tax deeds for over 20 years. It’s rare to find a 19-year-old with the confidence to begin investing in tax lien certificates and succeed so quickly. Darren Olstad is such a person. He attended a Ted Thomas workshop conducted in Edmonton Alberta, Canada and within weeks he went to an auction. I asked him to present and explain his experience at one of my events and here is part of his presentation where he discusses the fundamentals of tax lien certificate investing. Darren Olstad: So let’s get into the fundamentals of this business. 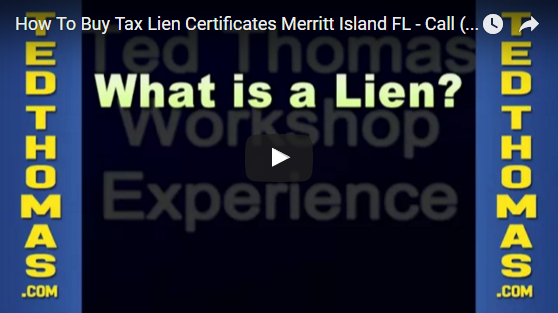 Who knows why tax lien certificates are issued? County services, more specifically money, they need money. But the money goes to the municipality because they can’t run on a deficit so they have a budget. If you’ve ever sat on town council you know that it’s just numbers just like running a small business the town could be a small business or a big business if it’s a big city. Second thing is the tax lien certificate is issued because when somebody doesn’t pay their property taxes, what happens? No money. If you run a small business and you have invoices out and they’re not paying you, what happens to your bottomline? It goes down. So what they do is they issue a tax lien certificate they sell the debt to the public and a tax lien certificate in itself isn’t worth anything. What makes that certificate worth something? The property behind it, the asset. It’s like a loan on a vehicle. So you can go and you can purchase this tax lien certificate and you can come out of the sale hopefully with something pledged against an asset of value and that’s what this whole event is about, how they teach you to find those assets of value. Let’s look at the process of how tax lien certificates work. The property become delinquent in taxes that’s after the taxpayer hasn’t for a certain period of time it’s specific to every county. The municipality then steps in and they can issue a tax certificate or a tax deed. It can go to auction. Now the timeframes in here are all different based on each states to you’re going to ask the questions like you’ve been learning about. It goes to auction. Investors can come to purchase it. If an investor doesn’t what happens? It can go back to the county. The investor purchase it then a timeline can come on if it’s a tax lien certificate and we’re going to wait for the redemption period to pay up. If they don’t pay up during the redemption period property owner fails to redeem it can go to foreclosure and it actually will revert back to the investor. If they don’t redeem the property you’re going to end up with a lien that’s free and clear. What is a lien? At law, lien is a form of security interest granted over an item of property to secure the payment of a debt or performance of some other obligation. So in Layman terms, it’s a debt with some of performance that has to be satisfied and it’s secured hopefully by an asset. First mortgage, second mortgage, I will keep this really quick here. This is title on a property. Is this title worth anything? If the property is worth something otherwise it’s not worth the piece of paper it’s written on. Think of liens like leech sucking equity out of the property. If we’ve got a first mortgage on the property and a second mortgage if you stop paying the second mortgage what’s the second mortgagee got to do? What’s stuck in his mind when he goes to foreclose? This first person, he who records first collects first, write that down. The first mortgage records first, the second mortgage is second because he recorded second. If there are other liens on a property when you go to get a mortgage what do they want you to do? You need to clear them up otherwise you won’t get a first mortgage to start this whole process. Now the reason I’m showing you this is where does the tax lien come into play? It doesn’t come in before or after it’s just always there. How come it’s priority? The government says so. I don’t make the laws I just make money from them. So tax lien is prior and superior to all other liens and encumbrances except what? IRS. So the tax lien is prior and superior to all other liens no matter what other than special assessments or IRS liens. So if the tax lien isn’t paid, does he have to pay out any mortgages to foreclose? No, because he’s in first position. He doesn’t care about anybody else. He’s the big shot in town he gets to foreclose on anybody, he doesn’t care. It doesn’t even matter if he has owed 10 cents, he can foreclose anybody. If I’m Mr. Second Mortgage and I’m going to get foreclosed on by the tax *0:04:41 what can I do? I could pay the taxes and I’ll bet that accounts for probably 90% of properties that don’t go to sale. The mortgage companies will advance the taxes and that’s also how come a lot of the times the mortgage company wants to pay your taxes for you. You pay them they pay their taxes so that they know it’s being taken care of. But literally, not so much now but there has been a lot of small banks merged into large financial institutions they were still on the old paper trail system and they would have a folder with your mortgage that stuff gets lost. And what happens when it gets lost? If the homeowner’s not paying and they’re not paying it’s going to tax sale. So that’s an example of how properties get to tax sale. People say, oh it’s there at the auction for a reason. Well it is there for a reason but probably other than you think. Ted Thomas: To learn more, go to my website at tedthomas.com.